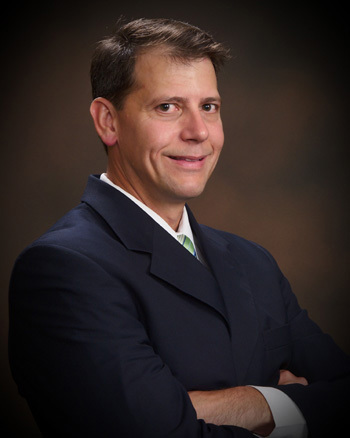 Since 1993, I have been committed to providing superior client service and legal representation for accident victims. I, myself, have suffered personal injury. I know what it is like to be the victim of another’s negligence. I have walked in your shoes. I know from experience how injuries suffered because of the carelessness or recklessness of another can alter your life. Physical injuries can affect your ability to work, to earn wages, to support your family and to pay your bills. Physical pain can limit your ability to work, to concentrate on tasks, to enjoy hobbies or activities, to interact with family and friends, or to enjoy life. Severe injuries, permanent disfigurement and permanent disabilities may lead to sadness, overwhelming anxiety, feelings of hopelessness or despair, all of which affect relationships with family and friends. I have walked in your shoes. I, too, have been involved in a lawsuit. That experience is what led me to become a lawyer. That experience is also why I intentionally limit my practice solely to the representation of victims. As a small firm, we are able to offer each client personal attention throughout each phase of the legal process. We will give you the personal attention we would expect as a client and the individual representation you deserve. 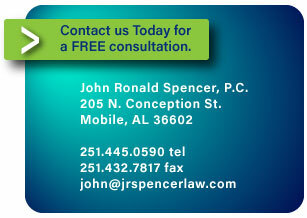 At John Ronald Spencer, P.C. clients are not just another file or just another case. We treat clients with integrity and respect for their individual needs. Dealing with insurance companies, lawyers, or the legal system can be complex and overwhelming. The insurance companies, their adjusters, and their lawyers know what they are doing – do you? Do not fall victim to their strategies and ploys. To them you are just a number. And, their goal is to keep that number as close to zero as possible. A simple call will put you in contact with a committed, local attorney who will handle all aspects of your case and who will work tirelessly to help you get what you deserve. For 18 years I have fought for the rights of those that have suffered harm at the hands of others. If you seek devoted, dedicated, compassionate and experienced representation you have come to the right place. I am available to provide a free consultation regarding your potential case immediately. Please, call now at (251) 445-0590.